I was picking up some books for an upcoming church study and decided to browse (no harm in shopping in God's bookstore, right? It's similar to tithing.) As I was moving around the store, I noticed this sign wedged under a book. My photography skills not withstanding, it was a warning. The full text read like this: "This book may contain thoughts, ideas, or content that could be considered inconsistent with historical evangelical theology. Therefore we encourage you read it with extra discernement." As the assistant manager wandered over (I'm sure I had been sighted on the security camera snapping photos of copyrighted materials) I asked him what he thought. He stated he didn't quite understand it, but he does what he's told. I asked him what other books were included and he said "Normally The Shack would have the sign, but it's on sale on the front, so we pulled its sign." I felt something rise up in me. I then began a calm, but higher pitched soapbox dance with Mike, the manager. I argued the sign should be on the front door, since everything in the store should be read with discernment, including the B-I-B-L-E. I claimed with passion that there should be a yellow hazard tape around the 5 shelves of Christian romantic fiction convincing God-fearing women that men like Michael Hosea from Francine Rivers' Redeeming Love exists. And don't get me started on Southern Gospel music. 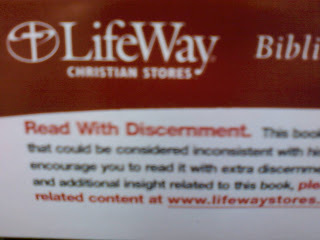 However, Lifeway has the right to sell or not sell anything they want. I appreciate that they aren't necessarily choosing censorship, but let's apply scripture to all we read, watch, and listen. Philippians 1:9-10 "And it is my prayer that your love may abound more and more, with knowledge and all discernment, so that you may approve what is excellent, and so be pure and blameless for the day of Christ,..."
I think that we should take all of the "questionable" material and burn them out front. Nothing warms me up like a pile of burning ideas. I remember doing a retreat in Michigan. There was an evangelist there named Ronnie Hill. He was getting all of the students to burn things that were not pure. I threw my only copy of "Night Shift." by Stephen King into the fire because it was getting between me and God. I wish I could go back in time as "future me" and slap "past me" in the face. I hope that I never inspire kids to such tepid displays of devotion and discipleship as that. Read with discernment and excercise self control (it is a fruit of the Spirit, look it up). I'm glad you pointed out Gospel music- one song about a Gospel ship and 80,000 songs about heaven? Really? I've been trying to finish reading about dang Michael Hosea for a year! Seriously! I received that book as a gift last Valentines day! I'm so slow! I'm soooo glad I read this. It reminded me to get on Amazon today and order my extra discernment. I'm running out. Wait... Are you telling me there is no Michael Hosea out there ??? ?